I have completed the flower and I must say I am over the moon with it. The only thing I am worried about is the time it is taking me. We are doing a bit of renovations on the house, so painting the dinning room has been taking up my time (what little I have left while being a mum to my 1 year old and 3.5 year old boys). First step was to create each petal. 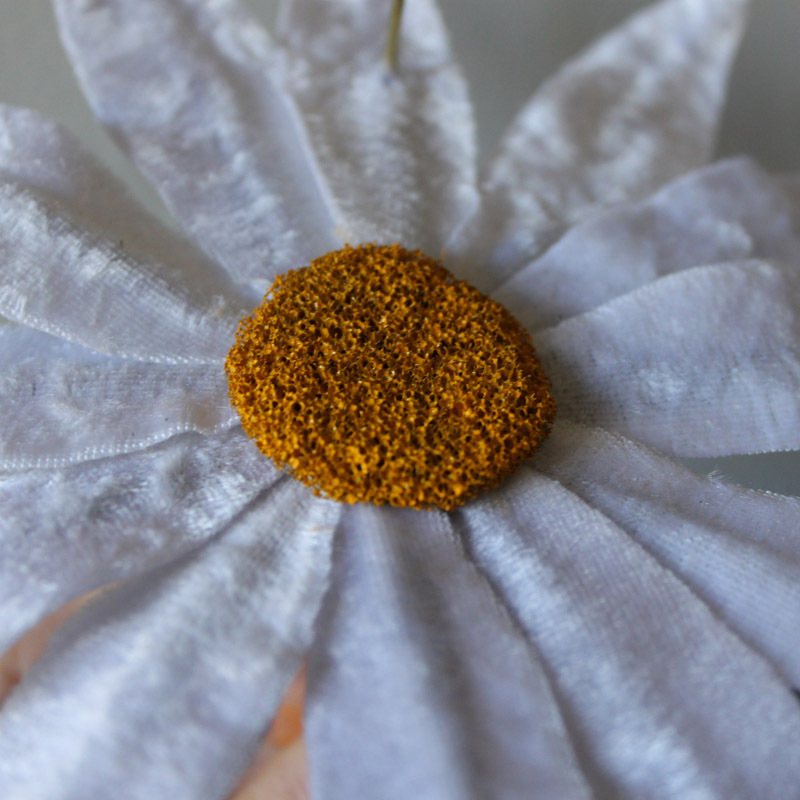 I started with a piece of silky cotton cut into the petal shape and a piece of wire super glued to the back of it. But I wasn’t happy with the look of the material. So the next step was to glue a layer of white velvet materiel with Fabri-tac onto the cotton. 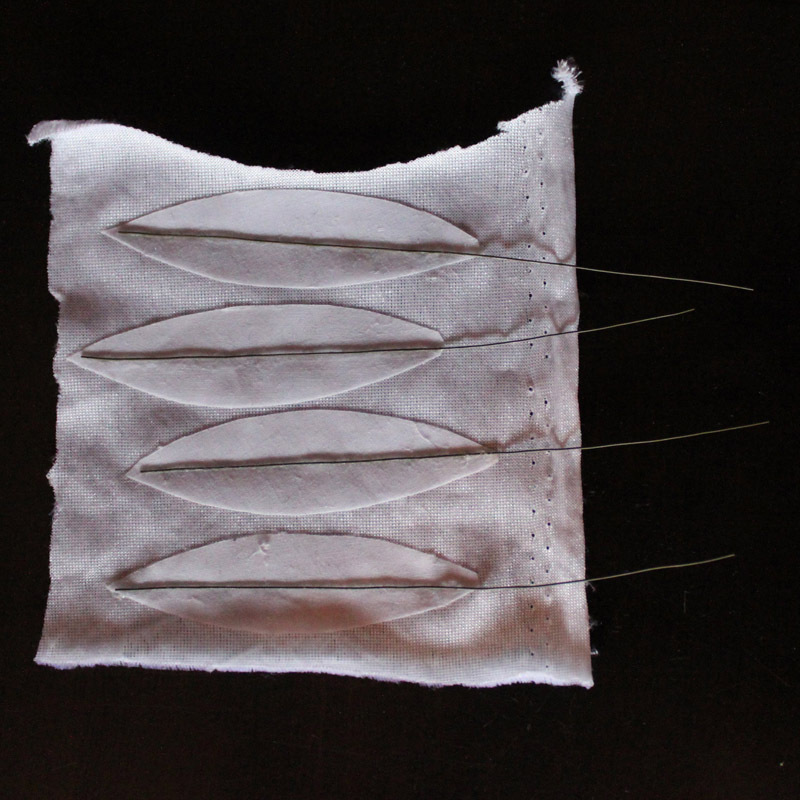 This picture show the velvet being glued to the cotton. 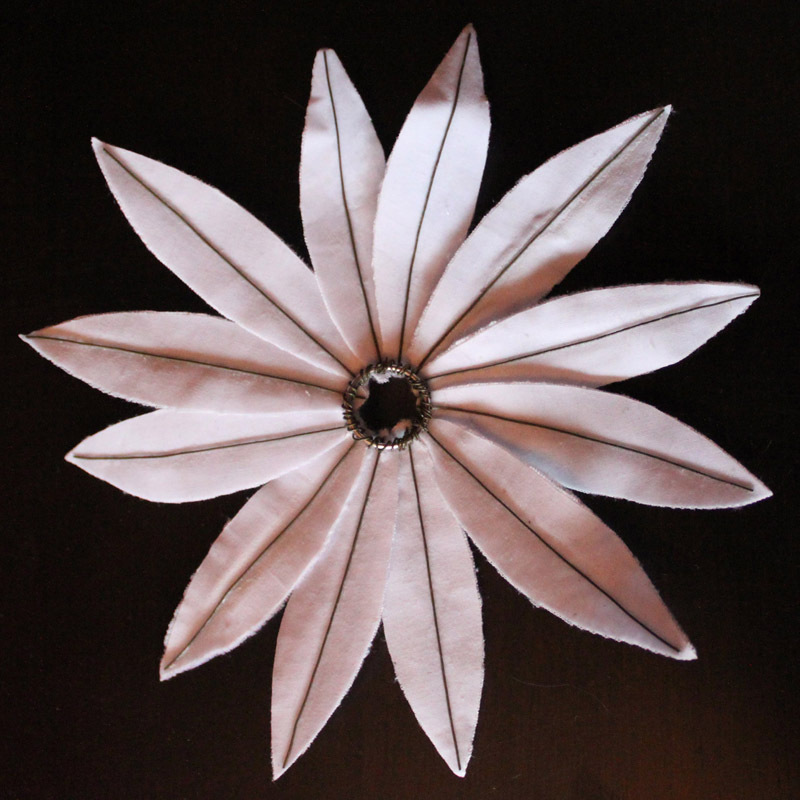 Once all 12 petals were made I attached them to a metal ring by twisting there wire around the ring. Next is to add the rod. I did this by making a round circle of chicken wire and taping it to the rod. The chicken wire was then tucked in under the metal ring. And a blob of superglue added to it to ensure the tape stays put. I then covered the whole area underneath with green tissue paper including the rod and little triangle pieces along the petal wire. The doll is positioned and the petal marked here I want her hand to sit. 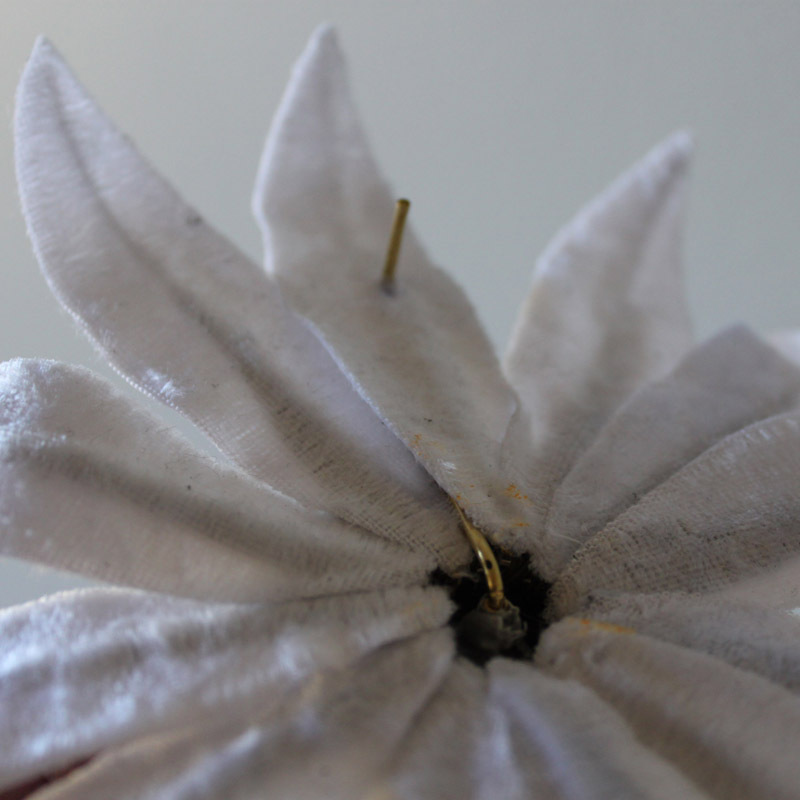 The armature line is then completed by adding a piece of rod in the tube, along the underside of the petal and up through the petal at the marked spot. Then covered with a piece of green tissue paper to match the other petals. The doll is tested on the petals and I can see that since the petals have a wire all the way along them I am able to bend each petal completely giving me full freedom to move and position the flower to suit my needs. The last step was to add the yellow center. I tried several materials to get the right look, including paper, cardboard and materials, but just couldn’t get it quite the way I wanted. Then one day I was tiding away some packing material and one piece was that grey soft spungie foam stuff. One look at it and I knew it was perfect. So I cut it to shape, painted it yellow and glued it on with fabrti-tac. 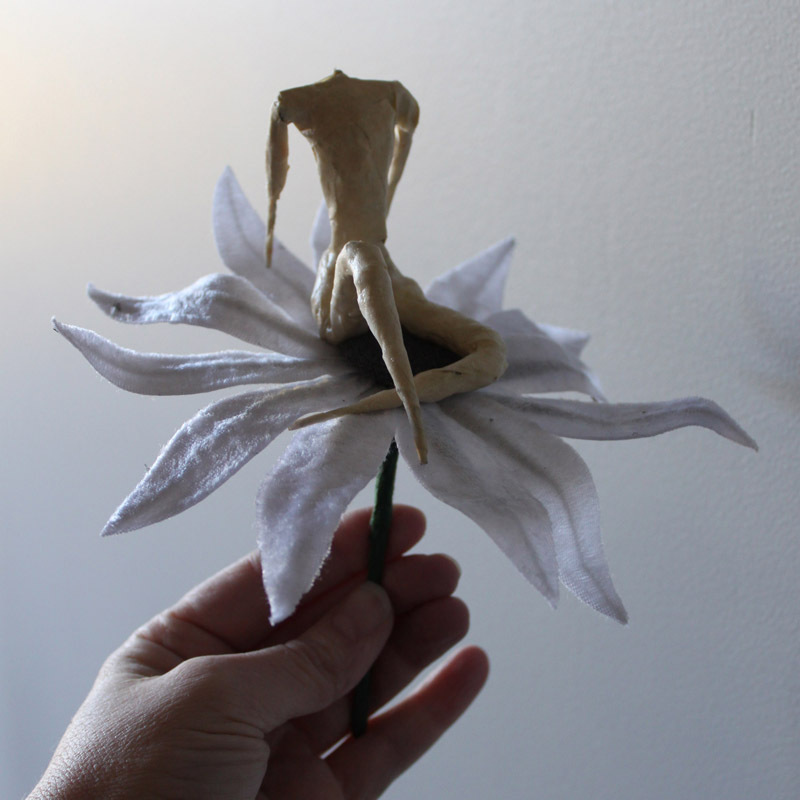 Finished – and I couldn’t be happier with it, its a beautiful flower and the doll looks awesome on it. Clicking on any image will open it up larger.